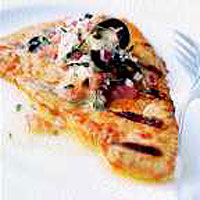 Tuna is ideal for this recipe, but swordfish steaks and salmon steaks or fillets work well too. A hinged wire basket is useful for turning all six pieces in one go. Whisk together the olive oil, lemon juice, tomato purée, garlic and seasoning in a shallow, non-metallic dish large enough to hold the fish. Place the tuna steaks in the marinade, turning to coat well, then cover and refrigerate for about 1 hour for all the flavours to be absorbed before cooking. Blend together all the ingredients for the herb butter, cover and leave at room temperature until required. Remove the tuna from the marinade and barbecue, brushing occasionally with the marinade, over a medium to high heat for 4-5 minutes on each side, or until just cooked through. Don't be tempted to overcook the fish or it will become dry. Serve the tuna steaks topped with a spoonful of the herb butter, which will melt temptingly over the tuna. This recipe was first published in June 1999.